Please feel free to call or e-mail mccfixit@hotmail.com with ideas for articles you would like us to write about. Low brake fluid is an indicator that shouldn't be ignored. So your driving along and that red brake warning light starts flickering sporadically when turning corners and going over bumps. You then check your emergency brake to see if it is partially set and all seems fine, the brakes are working perfectly. So now what? Check the owner's manual to see what the light means? Stop by your favorite shop and have it checked out? The truth is, both are correct. The red brake light can mean different things, but a flickering brake light usually indicates low brake fluid. 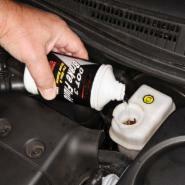 Now you've established the brake fluid level is below the minimum line on the reservoir. So what now? Just top it off and be on your merry way, right? This is good practice in a unhandy situation to get you home, but topping off the fluid did not fix the real problem. Once again, your car is trying to tell you something. There are only two ways the brake fluid level drops in the reservoir. A) A leak in the brake system hydraulics. B) Brake pad or brake shoe lining is worn below spec. Brake fluid reservoir capacity is sized according to the amount of fluid your brake system displaces to fill the brake calipers, lines and brake cylinders. As brakes wear down, the caliper pistons extend outward to keep the brake pads close to the rotor. When new pads are installed these pistons are compressed back into the calipers forcing the fluid back into the reservoir. Your brake fluid reservoir makes for a handy gauge to determine when your brakes need replacing. If the fluid is topped off unnecessarily, you'll bypass an important feature that could give you a heads up. Or worse, wait until you hear that nasty grinding noise that always seems to happen at the most inopportune time. 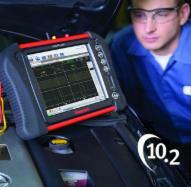 Diagnosing today's vehicles can be daunting even for the most seasoned professionals. 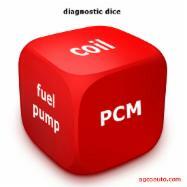 Most car problems aren't solved with one magic bullet. It requires a logical, experienced person who can approach a problem with an open mind and perform troubleshooting steps in a logical order. Some people may wish to bypass this process and utilize the sales gimmicks offered by many of the retail chain parts stores. They will perform a code check on your vehicle free of charge and provide a list of possible failures associated with whatever codes were stored. The drawback to this method is it usually results in a false diagnosis and unnecessary parts replacement. I can't count the number of times I've seen parts store employees recommend O2 sensors and MAF sensors when the actual problem was a vacuum leak. But, there's no code for a vacuum leak, no code for a break in a wire or a corroded terminal, no code for bad gas, no code for general neglect and any of those issues can set a multitude of sensor related codes. Trouble codes are meant to be used for looking up the proper troubleshooting flow chart which spells out what needs to be tested and in what order. The use of specialized equipment and many steps are necessary to properly diagnose today's vehicles. We also provide free code checks here at Mankato Crank and Chrome for the purpose of consultation and estimating diagnostic time. We promise it to be a simple and painless experience for you. Troubleshooting merely by code is a roll of the dice. Sometimes you get lucky but, in the end, the parts house always wins.